I use heavier gauge strings than I do on my regular dulcimers (Think they are .015, .015, .025, .032). Mike Clemmer puts two notches for each string in the nut so you can use the high setting for a steel slide like a dobro or low setting for regular fretting or a glass slide-which is what I'm using in this video. The heavier gauge strings hold up to the slide even with low action especially using 2 melody strings in a 4 equidistant setup. I don't know how I missed this, Phil, but this is wonderful! Is the action higher on a Clem-bro than a dulcimer? You certainly have a light touch. I do slide on guitar but the action on my dulcimers is too low. 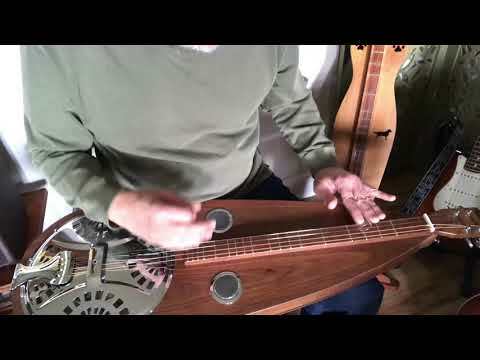 I considered using the dulcimer I use for the low tension tunings DAA DF#A etc. since they have heavier gauge melodies. I may just shim it 1/16" and see what happens. I'm just sliding on the strings-not really pressing down. I found that 2 melody strings gives the slide more support so you don't hit the fretboard and go clunk. You do have to be right over the fret to get the right note. Phil, I'm curious- are you actually pressing the strings down to the frets with your slide, or just letting the slide do the 'fretting' ? Thanks folks! When I first saw one of these I thought somewhere a car is missing a hubcap. I love this song, and your playing on your Clem Bro, makes me like it even more. Great. I was just playing around with a slide the other day. Lots of fun. Thanks for posting. That's great,Phil! Looks like it's got a 9 1/2 inch resonator with a spider bridge. You sure won't get drowned-out in most acoustic mixes!